It seems the latest line to develop your range into is cleaning products, with a number of new names on the shelves among those long established. Muc-Off and Red Ant both sent us a box full of products to test, and being as my enthusiasm for cleaning scooters is little and infrequent, I thought it best to draft in some support. 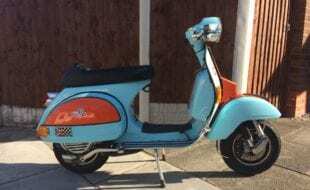 For this I approached custom scooter owner, rider and (in the nicest way) OCD cleaner, Mark Swinge for his advice. 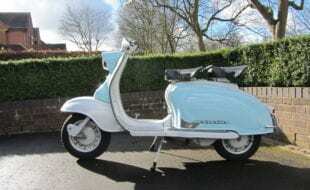 Since completion, Mark has ridden his Start Me Up Lambretta or street racer custom Lambrettas to rallies all over the UK during the last 18 months or so, studiously cleaning before he departs his home, upon arrival, pre-custom show, and again once back at home after a weekend away. He does this with an attention to details and a smile on his face too, something I can only admire considering some of the miles ridden—and having gone part way with him back from Scotland before he was forced to abort the journey and get recovered, and spending eight hours riding back in a monsoon from another rally with him, I know if it was my scooter then cleaning it would be the last thing on my mind when I eventually reached home. But clean them he does, as does his son Jordan and wife Vicky who also both own and ride custom scooters, so with all this cleaning experience, what were his impressions of it all? 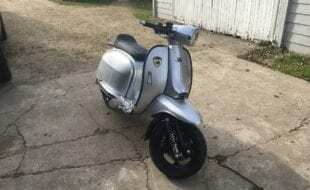 Among the new products I gave him to try were cleaners, wax, polish, speed polish, detailer and more.., so we began at the beginning, with a post ride clean, although as Mark did explain, his scooters never get as dirty as mine as his regular cleaning routine doesn’t allow them to! Mark was happy with his Autoglym shampoo, but the Muc-Off Bike Cleaner (£8.50 per litre) did its job well, removed the dirt and dead flies, and impressed Mark enough to buy some more when the first bottle eventually ran out, shunning the Autoglym. The Red Ant (£7.95 per litre) didn’t clean as well, left a bit behind and overall didn’t really impress. 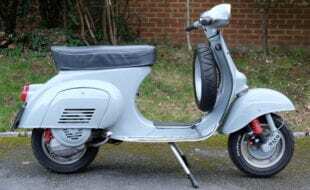 To add to Mark’s comments on initial cleaning, I can say that the Red Ant Motorcycle Power Clean (£9.49 for 500ml) has proved great at removing excessive road dirt from heavily contaminated engines and under frames/bodywork. It actually changes colour when reaciting with dirt. 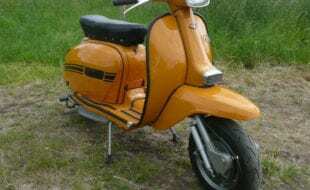 It unfortunately smells of rotten eggs, and will affect a DIY paint job (e.g. rattle can touchups), but for cleaning for a mileage bike that’s had little care, it’s pretty damn good. 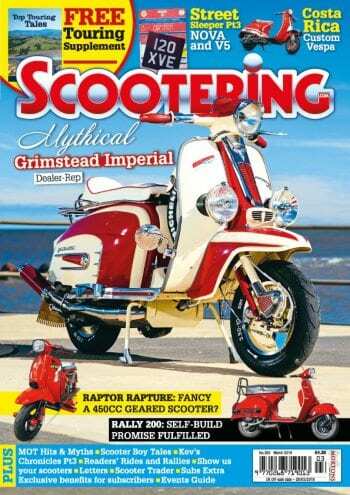 Mark’s next step was to polish/was his scooter. 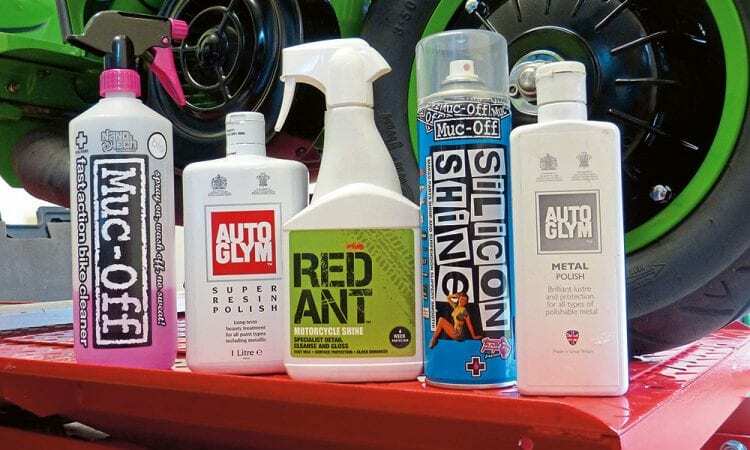 The Red Ant Motorcycle Wax (£11.95 for 500ml) proved okay, but left us a bit of a dusty finish and generally didn’t quite meet the same standards as his favourite Autoglym Super Resin Polish (£10.75 for 375ml). Another favourite of Mark’s here is Zymol (£27 for 8.5oz). 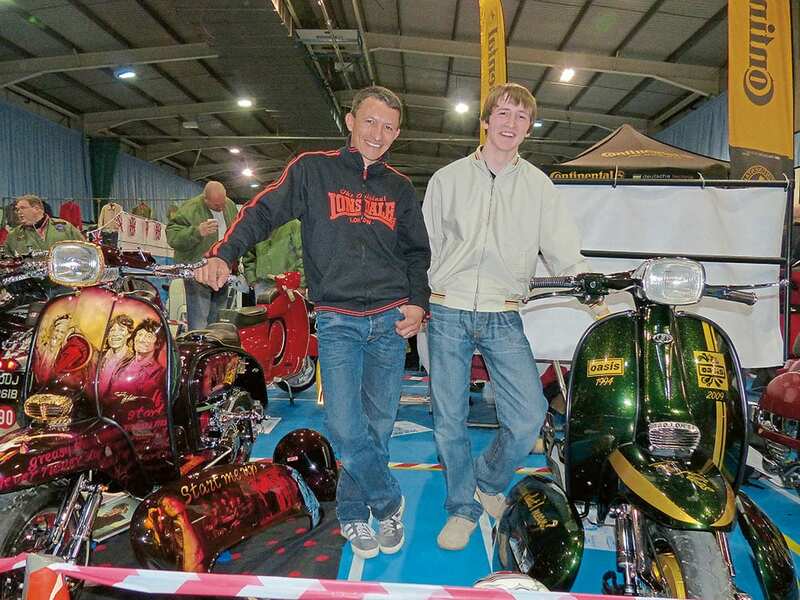 “Detailing wax I use at an event as a quick clean, a quick spray and buff over,” explained Mark. 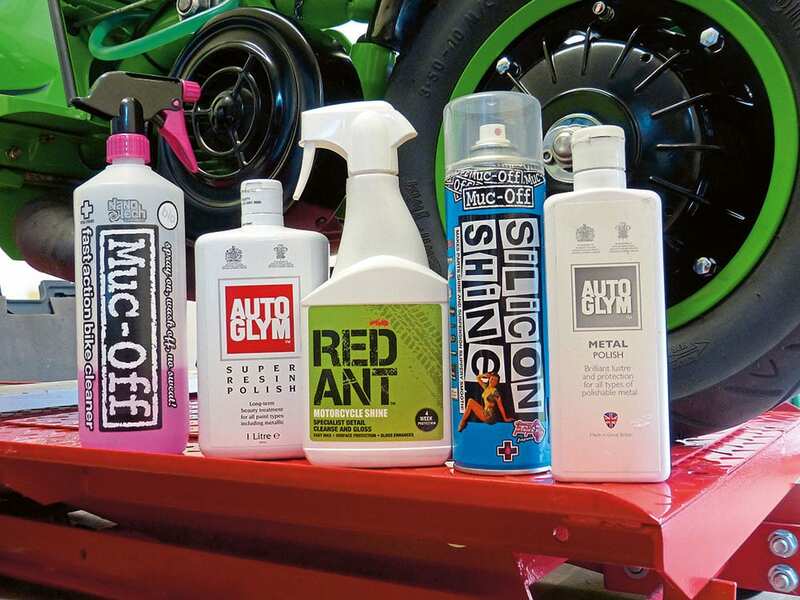 His next test was the Red Ant Motorcycle Shine (£6.65 for 500m1) and Muc-Off Split Second Detailer Wax (£7 for 500ml). “I found both to be pretty similar. The Muc-Off however didn’t leave as smooth a finish, not glass-like to the touch, which I’d expect to feel when I polish. It looked clean, but looked to leave a residue, so I did a hosepipe test to see if it was rain protective but it wasn’t. 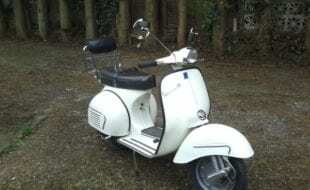 Finally, to complete the preparation of his scooter for showing, Mark uses AutoGlym Metal Polish (£6.75 for 325ml) for polishing the brightwork. 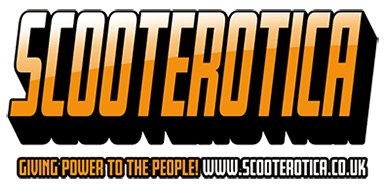 So there you have it; if you’ve a nice scooter and want to keep it looking that way, then regular cleaning is advised, and these products do it to a show-winning standard!